Kevin's 2016 Walk at CBA. The crowd is praying with Kevin. Kevin Kret pictured before his July 09 accident that caused a traumatic brain injury. Kevin's father Michael Kret pushing Kevin and Kevin's mom Joan to the left. This was a previous walk for Kevin at CBA track. MIDDLETOWN, NJ: JULY 17, 2017 -- The entire community is welcome to join the 'Walk the Walk With Kevin Kret,' (Kevin's Walk) - an annual event to gather in prayer, and show support for Kevin and his family. 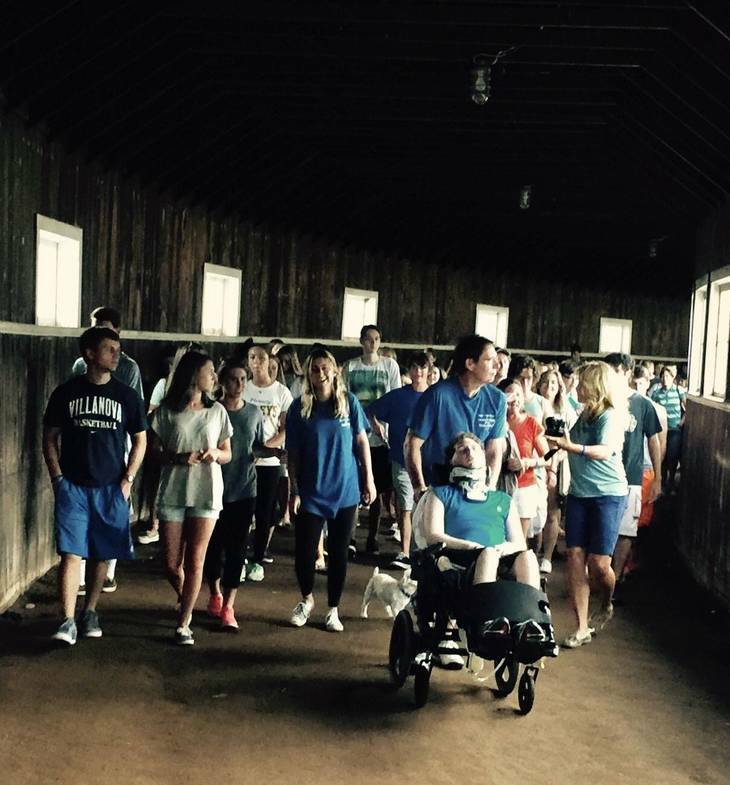 This year's walk will once again be held at the barn/horse arena at Christian Brothers Academy (CBA), rain or shine, 850 Newman Springs Road, Lincroft, NJ, August 8, at 6:00pm. The walk is casual and donations to help with Kevin's medical expenses are optional. Shortly after 6pm, the group will begin to make a few laps, everyone walking at their own pace around the arena (for those that cannot walk the laps, you are welcome to bring a folding chair and show support from the sidelines). The walk itself is fairly quick, a few laps and then the crowd will gather to hear a brief update about Kevin's medical progress, and the event will culminate with everyone joining in prayer together with Kevin. 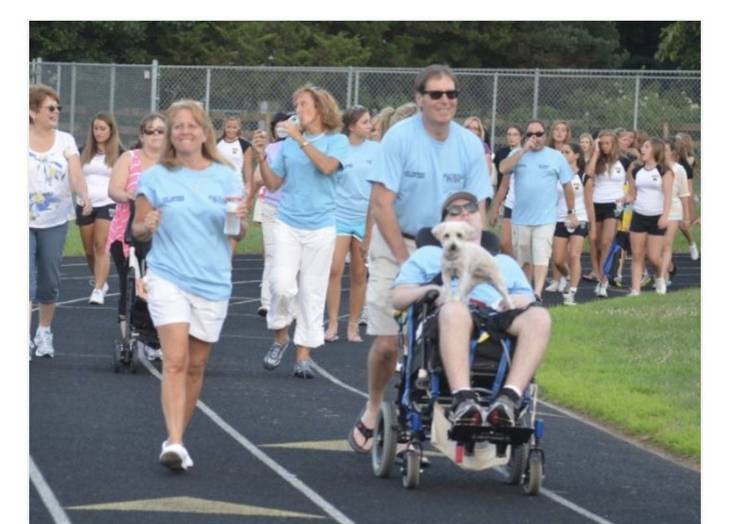 One of the founders of 'Kevin's Walk' Lisa Ardito of Monmouth Beach (formerly of Holmdel), says, "Every year at 'Kevin's Walk,' we are all uplifted and emotionally moved. It doesn't matter what your faith is, when you witness and are a part of a crowd of all ages; adults, the elderly, children, teens, babies in strollers... all praying together and gathered around Kevin, it is a beautiful and moving experience." Although 'Kevin's Walk' is a fundraiser to offset his unpaid medical expenses, donations are always optional and Kevin's family's priority is 'prayer for Kevin.' Kevin's mom Joan Kret says, "We really just want people to come to join us for the walk and pray for and with Kevin. We are so thankful to all who attend and show support for our Kev." On July 31, of 2009, Kevin a former graduate of both Saint Leo the Great School and CBA (both in Lincroft), had just finished his first year of college at Villanova University, when he suffered a traumatic brain injury in his Middletown, neighborhood while falling off of a skateboard after hitting debris in the road. Since that time, Kevin has been in a minimally conscious state. Kevin's injury was to his brain stem, often referred to as 'the mother board to the brain.' Since his injury, Kevin although conscious, is unable to communicate and remains trapped in a coma like state. Kevin is cared for in his home by his loving family. Every day Kevin receives 24 hour care and medical therapies from home healthcare professionals. Kevin is the oldest of Joan and Michael Kret's four children. Kevin's siblings are Dylan, Meghan and Jenny.